Director – Mike Hodges, Screenplay – Lorenzo Semple Jr, Based on the Comic Book by Alex Raymond, Producer – Dino De Laurentiis, Photography – Gil Taylor, Music – Queen, Photographic Effects – Frank Van Der Veer, Model Effects Supervisor – Richard Conway, Flying Effects – Derek Botell, Special Effects Supervisor – George Gibbs, Production Design – Danilo Donati. Production Company – Starling Productions/Famous Films. Ming, Emperor of the planet Mongo, decides to toy with the Earth and wields a ray that causes the weather to run havoc. A plane carrying New York Jets quarterback Flash Gordon and travel agent Dale Arden is caught in a storm and crashes into the laboratory home of ex-NASA scientist Dr Zarkov. Zarkov forces Flash and Dale into his homemade rocketship at gunpoint and they take off to Mongo. On Mongo, they are captured by Ming who decides to marry Dale, execute Flash and drain Zarkov’s brain. However, Flash is saved by Ming’s seductive daughter Princess Aura. He valiantly travels through the kingdoms of Mongo to unite the people of the Tree Kingdom and their enemies the Hawkmen against Ming. When George Lucas originally conceived making a science-fiction film, he had wanted to make another Flash Gordon film after the famous serials of the 1930s. However, he found that the rights were too expensive to obtain so he went away and devised his own space opera instead. The result was Star Wars (1977) and the rest is history. The grand irony that Lucas then faced was that Star Wars was so much of a success that he found Flash Gordon being revived as one of his own imitators. When the Flash Gordon remake was announced to the world, fans of the serials and original comic-books sank in dismay at some of the people behind it, namely producer Dino De Laurentiis and screenwriter Lorenzo Semple Jr. De Laurentiis and Lorenzo Semple Jr had previous collaborated on the disastrous remake of King Kong (1976), which subjected the original King Kong (1933) to a horrendously campy spin. Furthermore, Lorenzo Semple Jr had worked as script editor on the Batman (1966-8) tv series, which likewise camped up a comic-book fan favourite. Surprisingly enough, the camp approach is one that works well for Flash Gordon – most of the time. The tone of the film closely resembles a couple of delightful films that Dino De Laurentiis made back in the 1960s in his native Italy – Danger: Diabolik (1967) and Barbarella (1968), both of which were also adapted from comic-books. The film here takes the quaintly thirties-styled Art Deco palaces and rocketships of Alex Raymond’s original comic-strip and goes completely wild with them. Danilo Donati’s sets and costumes jump off the screen and assault the eyeball with their brilliant scarlets, oranges, blues and yellows – sometimes all at once. The film is filled with delightfully playful visuals – hourglasses that run upwards and aliens that bleed bright blue blood, even Ming’s dispatch impaled on the needle-tip of a rocketship that crashes into his throne room. Everything is underlined by a wonderfully catchy score from Queen, the kings of camp rock. The film’s major liability is Sam Jones, cast when Dino De Laurentiis’s grandmother spotted him as a contestant on the tv gameshow The Dating Game (1965-86). Jones fails to project any of Buster Crabbe’s sharp-witted leadership qualities or ingenuity, making this Flash a dumb, muscle-headed jock. Dale Arden is equally flat, given a banal, insipid airing by model Melody Anderson. The film’s casting joy is Max Von Sydow, who steals the film with a delightfully tongue-in-cheek performance as Ming – when asked why he wishes to destroy the Earth, his reply is merely a grand shrug “Why not?” Brian Blessed, one of the great over-actors in the English film industry, is, as might be expected, boisterously loud, but tackles proceedings with an enthusiasm that one wishes would have worn off on Sam Jones. The film also features Timothy Dalton, dashingly handsome as Prince Barin, and the edibly luscious Ornella Muti oozing seductiveness as Princess Aura. The effects work is generally good, although there is some unconvincing matte work with the floating kingdoms. However, there is at least one unforgettable shot – that wonderful moment the camera pulls back into wide-angle during the Imperial cruiser pursuit of Flash’s rocket bike through a red cloud, to reveal hundreds of Hawkmen all waiting on the other side. The original Flash Gordon serials are:– Flash Gordon (1936), Flash Gordon’s Trip to Mars (1938) and Flash Gordon Conquers the Universe (1940). All three are regarded as some of the finest entries in the usually creatively impoverished genre of the serial. The character of Flash was revived in a brief-lived live-action tv series Flash Gordon (1954) starring Steve Holland, which is poorly regarded by fans. At the same time as this film, Dino De Laurentiis in conjunction with Filmation also sponsored a little-seen animated tv series Flash Gordon/The New Adventures of Flash Gordon (1979), which lasted for sixteen episodes. There was a subsequent animated series Flash Gordon (1996), which recast the central characters as teenagers. The poorly regarded Flash Gordon (2007-8) was a live-action remake for television starring Eric Johnson. During the 00s, director Stephen Sommers was purported to be considering a big-budget live-action remake, which was then announced under Breck Eisner for 2012. Flesh Gordon (1972) was a X-rated parody and let to a sequel with Flesh Gordon Meets the Cosmic Cheerleaders (1991). 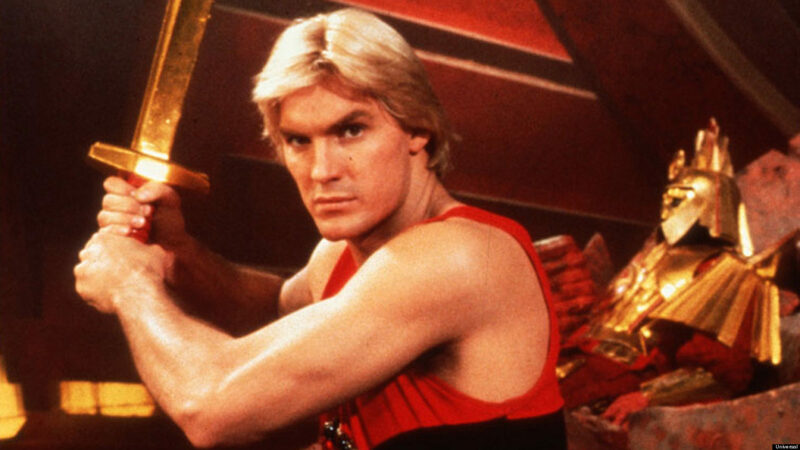 This version of Flash Gordon was also substantially referenced in Ted (2012) with several scene recreations and Sam Jones making a spoof appearance as himself. British director Mike Hodges’s other genre films are the Michael Crichton adaptation The Terminal Man (1974), the script for Damien: Omen II (1978) (which he was originally set to direct before being fired), the genre parody Morons from Outer Space (1985), the superb and underrated clairvoyance thriller Black Rainbow (1989), while he also co-wrote The Breakthrough/The Lifeforce Experiment (1994). For television, Hodges has also made The Healer (1992) about a faith healer and Murder By Numbers (2004), a documentary about the screen portrayal of serial killers. Hodges is probably best known as director of the original Get Carter (1971). Intriguingly, the original director for Flash Gordon was to have been Nicolas Roeg, the arty director of the likes of Don’t Look Now (1973), The Man Who Fell to Earth (1976) and The Witches (1990). 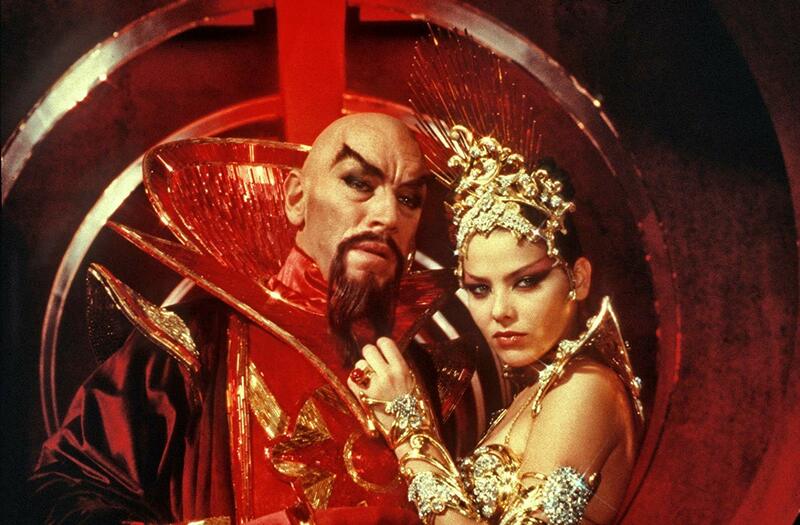 A Nicolas Roeg production of Flash Gordon would have been absolutely fascinating.